Would you believe that dangerous, potentially deadly, supplements are being sold to consumers every single day, and the Food and Drug Administration (FDA) actually knows about it? The Doctors shared that amphetamine is a stimulant found in prescription and illicit drugs. But shockingly, it can also be found in over-the-counter weight loss and workout supplements. New findings say the supplements contain a chemical identical to the drug Speed. The chemical they’re talking about is called BMPEA and it is nearly identical to amphetamine. The Canadian government has pulled nearly all products that have the ingredient from store shelves, calling it a “serious health risk,” but it’s still on U.S. store shelves. The article came out in The New York Times, and the author claimed that two of the top FDA officials were former leaders of the supplement industry, and that the FDA knew two years ago that nine supplements contained it, but never made the information public. Dr Jennifer Ashton wanted to know why consumers were still ignoring the risks because the dangers of supplements have been known for quite some time, yet people continue to buy them. Dr Rachael Ross said it’s because people are taking any risks to lose weight. She said the issue is that as you’re taking it, without doctor supervision, you could end up killing yourself. Dr Travis Stork said there are stimulants out there that have been prescribed for medical weight loss, but he’s concerned specifically about the BMPEA. He said he’s upset that the tax-funded FDA isn’t “blowing the horn” when it’s known that there are dangerous ingredients in the supplements. The Doctors shared the side effects of BMPEA, which included increased blood pressure, heart rate, and body temperature, as well as cardiovascular complications like stroke, suppressed sleep, suppressed appetite, and addiction. Dr Drew Ordon said it can be especially dangerous if you’re mixing medications. Dr Ashton said there is no quick fix for the massively complex problem of obesity. If you’re taking something over-the-counter without supervision, and you’re losing weight, you should consider the serious implications because if something works, there are risks and benefits. Dr Stork said it’s time for the FDA to step up. Have you ever purchased weight loss supplements? 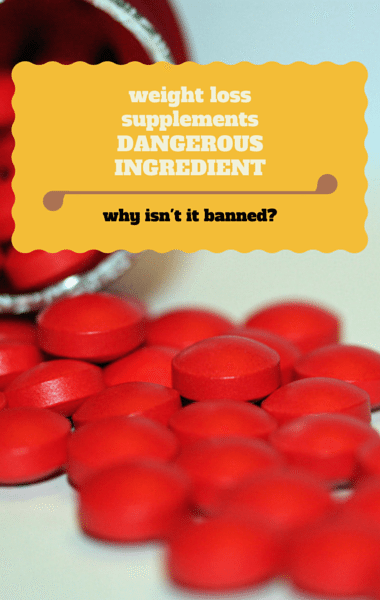 Will you avoid buying them now that you know the dangers? What do you think about the FDA’s lack of action?